Lake Atitlan front, 2 bedroom/2 bathroom apartment. 1200 square feet of living space, will accommodate up to 6 people. 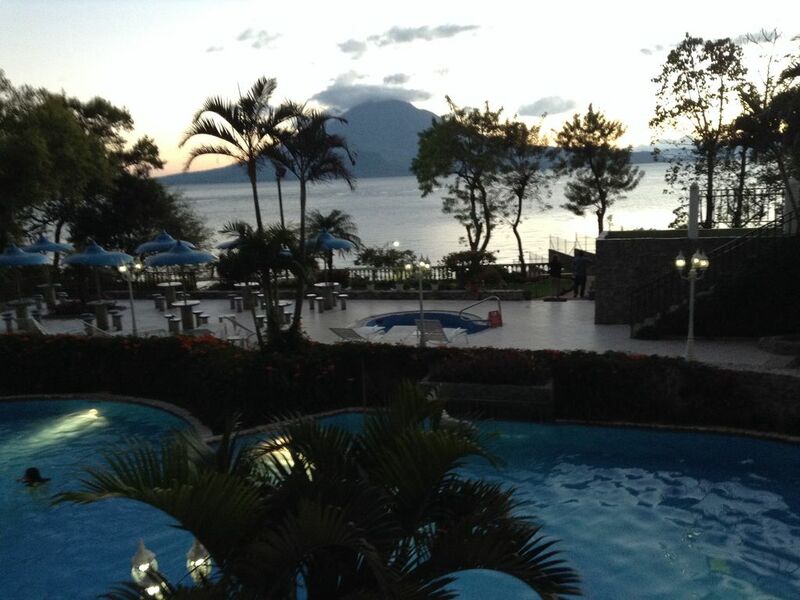 Apartment is located in the owner’s tower of La Riviera de Atitlan Resort. Two private elevators to go up and down from the lobby. Resort offers amenities such as heated swimming pool and jacuzzi, as well as access to the lake. Also offered is restaurant with catering to your front door. The apartment has a beautiful panoramic view to the gardens, pool, lake and volcanos. It’s a 5 minute walk away from attractions such as Xtreme Zipline and a butterfly sanctuary, and a 10 minute walk from town along a protected nature reserve path. Private deck offered in front of Resort on Lake Atitlan for boat boarding. Moto taxi pickups and drops to and from town for one dollar. Don’t settle for less.. don’t pay for one room when you can have a Resort for the same price as a small suite in an old or faraway hotel. Gracias 🙏�🏻� por brindarnos con tu bella presencia... hasta pronto ! Dios te bendiga. We stayed two months and loved it. The apartment has a gorgeous view and plenty of space. We enjoyed the location as it was quiet and peaceful after our days spent on launches and walking around the various pueblos of the lake. When one is long term it is nice to have creature comforts. Furniture was comfy, kitchen well stocked, and the pool and hot tubs a bonus. We walked to town daily from here (only a mile). Best of all the owner, Oscar, responded quickly to our questions and addressed concerns immediately. We would love to return again. Maria , fue un gran honor tenerles de huespedes.. mi casa tu casa . esperamos que regreses pronto.. gracias 🙏. Nice with a beautiful view! The property was great, it had most everything we needed. If there was anything we needed the owner Mr. Jimenez always found a way to provide it. He was also always available to answer my questions and was very friendly. The only reason I didn't give it 5 stars is that while the hotel that is kind of sharing a lobby area with this apartment let us utilize the swimming pool, they would not let us use any of the games or kayaks that they had. No one was using them at the time, and surprisingly they wouldn't let us rent them either, always saying that they were for their guests only. This was also the case with their wifi, which the apartment does not have. That being said, as long as you go there knowing this, we had a great time and enjoyed the apartment a lot! Nice with a few issues. Nice apartment just outside of Panajachel....Easy to walk to town-20 min. Nice views. Pool and hot tub were the only available amenities if you weren't staying at the hotel next door. Pool was unusable for about five days because it was green in color. No Wi-Fi in apartment. Could not use hotels Wi-Fi. Apartment needs a broom and hot water. One shower unusable due to leak. Owner very nice and responsive. Thank you Lisa, for staying in the apartment I'm sorry that the Pool didn't work. All issues have been fixed. We would like to see you soon. Is there a balcony on this unit to the outside? Yes it does ... From the master bedroom! We love the area, the space everything was exactly like in the pictures! We will go back!! !